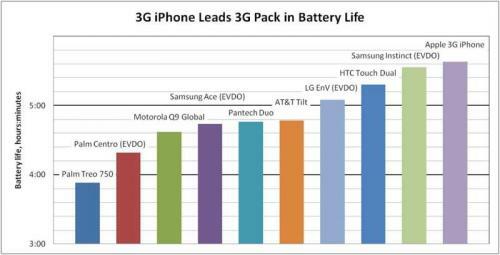 PCWorld has performed some real-life battery testing on the Apple iPhone 3G and found that while its battery is worse than the original iPhone, it still beats many of its competitors. In their tests, they found that the talk time ran for an average of 5 hours and 38 minutes as compared to 10 hours in their tests for the original iPhone. 5 hours and 38 minutes was enough to best the other 3G phones in their testing (see graph above). The results, however, have been criticized due to the omission of the 3G Blackberry.